TOKYO -- Honda Motor Co. will unveil a near-production version of its hydrogen fuel cell fastback sedan at the Tokyo Motor Show late this month, throwing down a challenge to Toyota Motor Corp.'s Mirai fuel cell vehicle released this year. The tentatively named FCV fuel cell vehicle is a pre-production prototype of the five-seat hydrogen-powered sedan expected to go on sale next year. Honda said it expects its FCV production model to deliver a full-tank driving range of more than 700 kilometers (435 miles) and a refueling time of three minutes. That compares with the Mirai's 312-mile range. The near-production FCV gets slightly toned-down sheet metal from the sleek futuristic concept that Honda unveiled in November 2014. It is lower, wider and longer than the Mirai and seats five to the Mirai's four. Honda said its fuel cell vehicle achieves a truer low-hood sedan silhouette thanks to a downsized fuel cell stack that fits compactly into a normal-size engine bay. The stack generates 130 kilowatts at a power density of 3.1 kilowatts per liter. Electricity is stored in lithium ion batteries that power the wheels through a 130-kilowatt motor. 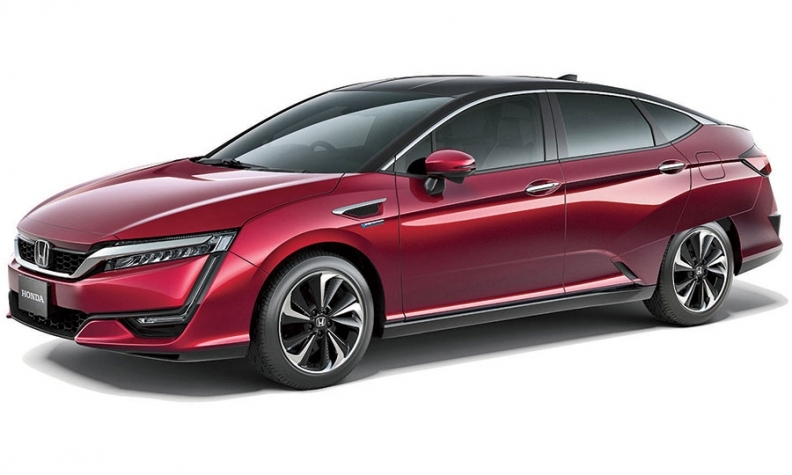 Honda said it reduced the size of the new fuel cell stack by a third, from its previous-generation technology, so that it is about as big as a 3.5-liter V-6 gasoline engine. That will enable Honda to deploy the powerplant in various vehicle types, which will help popularize the technology, the carmaker said. Placement of the entire stack under the hood also allowed Honda to free up cabin space and squeeze in the fifth seat. Many automakers are positioning hydrogen fuel cell vehicles as a future alternative drivetrain. The systems generate electricity through a chemical reaction in the fuel stack between hydrogen and air. Heat and water vapor are the only emissions. But making the costly systems practical remains a challenge and has led to tie-ups in developing the technology. Honda has already teamed with General Motors to develop a next-generation hydrogen fuel cell system due around 2020. Toyota is cooperating with Germany's BMW AG, and Nissan Motor Co. has partnered with Daimler AG and Ford Motor Co.